When no one laughs at Lucy's jokes or wants her for a bridge partner, she comes to the conclusion she is inferior. The next morning, she oversalts Ricky's fried egg, leaves the pits in his orange juice, and burns the toast. She cries: "I'm a big fat flop!" Depressed, she retreats to her bed, where she intends to remain for life. Ricky worries and tells Ethel he's going to consult a "physio-chiatrist." Dr. Henry Molin suggests flattery, by someone other than Ricky, as the answer. He says he'll arrange to have someone, who will call himself Chuck Stewart, arrive at the Ricardo apartment at 8PM. Who shows up but the handsome doctor himself, who precedes to sweep Lucy off her feet, a little too far. Ricky doesn't take too kindly to the "treatment" and throws the headshrinker out, opting for a less expensive solution. With the Mertzes' help, he bends over backward in praise of Lucy's joke telling and card playing even Lucy's singing. Alas, Lucy is cured. Special Notes: This is the second flash back episode since "Lucy goes to the Hospital". 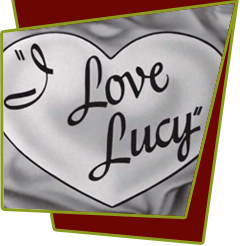 This episode is based on lucy's radio show, My Favorite Husband, Episode #116, "Liz's Inferiority Complex". Bloopers: During the final credits, the announcer makes a mistake and says "The part of Dr. Stewart was played by Gerald Mohn." Mohn played Dr. Henry Molin, who pretends to be Ricky's old friend Chuck Stewart.